Our macrame hanging shelves are made by tight textured cotton cord and high quality natural pine.The materials have been carefully selected and never cut corners to guarantee product quality and use life. You can place your beloved flowers,succulents,small decorations or books,photo frames and so on, to create a cozy home environment. These macrame hanging shelves are pure handcrafted.The product is carefully crafted by us and takes every detail seriously. We are committed to providing our customers with new, unique and distinctive products. Every single detail and innovation will give you different experience. 【Top Quality & Stylish Design】Delicately macrame handmade by tight textured cotton cord,solid raw wooden base and hanging circle part made by natural pine. Wooden beads and macrame tassel also give a stylish and Bohemian look. 【Stronger & Safer Hooks】Package contains 2 ceiling screw hooks,stronger and durable than normal ceiling hooks.They can hold over 10 pounds.You can install them anywhere of your house and do not worry about the risk of loose hooks and falling pots. 【Perfect Indoor & Outdoor Decor 】You can hang on both sides of the TV wall, bedroom, balcony, garden,or to decorate your shop, wedding scene ,birthday party,and a variety of indoor and outdoor corners . Ideal for display your beloved flowers, succulents, small herbs, books and photo frame to create a dreamy and warm space in any room. 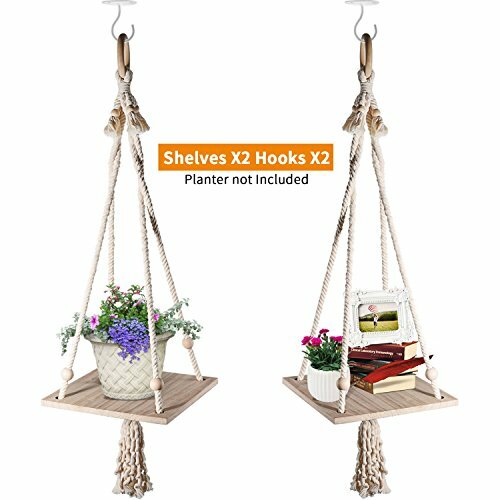 【Ideal Gift Choice】Unique Hand-made Planter hanging shelves are great gifts for your friends or family, especially who love to grow plants,and love to decorate their rooms.Also the perfect gift for Christmas, Thanksgiving,Birthday or Mother's Day. 【Product Size】Each wooden shelf is appr. 11.8"x11.8"x0.59"(L X W X H).Each Macrame Hanging shelf is 43" length totally.Its length of the tassel is approx 11.8".Each ceiling screw hooks is about 2.56" length. If you have any questions about this product by HomeNote, contact us by completing and submitting the form below. If you are looking for a specif part number, please include it with your message.